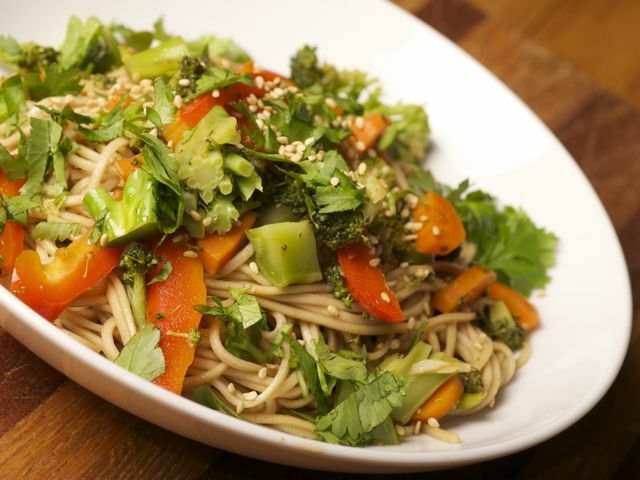 This colorful and simple dish uses soba noodles, a popular pasta in Japan. Serve cold or hot. Cook the soba noodles according to the package instructions. Transfer the soba to a colander and rinse with cold water to stop the cooking process. Drain well. Place in a large mixing bowl. Meanwhile, place the ¾ cup water in a large sauté pan over medium-high heat. Add the broccoli and carrots and cook until all of the liquid is absorbed, stirring frequently, approximately 5 minutes. Lower the heat to medium, add 2 tablespoons of the sesame oil, and stir well. Add the red bell pepper and garlic, and cook until all of the veggies are just tender, approximately 5 minutes. Place 2 tablespoons of the sesame oil, ¼ cup water, the soy sauce, the mirin (if using), the lime juice, and the crushed red-pepper flakes in a small bowl and whisk well. Add half of this mixture to the soba noodles and toss well. Add the remaining half to the sauté pan with the vegetables and stir well. To serve, place a portion of the soba noodles in a serving bowl. Top with some vegetables and garnish with the green onions, cilantro, and sesame seeds. Variations: Try replacing the broccoli with an equal quantity of cauliflower. Replace the carrots and red bell pepper with mushrooms, zucchini, yellow bell pepper, or summer squash. Culinate editor's note: We prefer a higher vegetables-to-noodle ratio, and so used 12 ounces of noodles for this dish.